This Salted Caramel Marshmallow Acorns recipe is adorable for fall or winter and incredibly easy to make! It’s perfect for serving at a party or your Thanksgiving gathering! This will make 10 pops, so double the recipe if you need more. Take your lollipop sticks and poke them into the bottom of each marshmallow. Push them up about halfway into each marshmallow. Pour your chocolate discs into a microwave safe bowl and heat for 30 seconds. Remove and stir in thirty second intervals until melted. 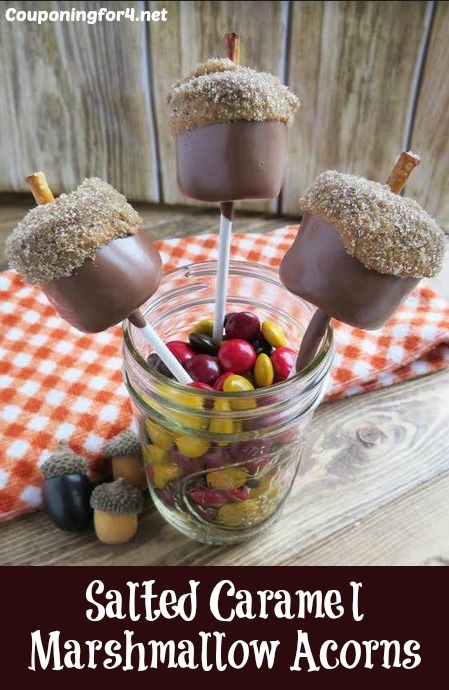 Take a lollipopped marshmallow and dip it in the melted chocolate, being sure to cover completely. Tap on the edge of the bowl to remove excess chocolate. Place in a decorating stand, styrofoam block or lay on a piece of parchment paper (not ideal, but a great backup!). Place in the refrigerator for 3-5 minutes or until hardened. Place your sugar into a small bowl and set aside. Pour your salted caramel discs into a separate microwave safe bowl and heat for 30 seconds. Remove and stir in thirty second intervals until melted. 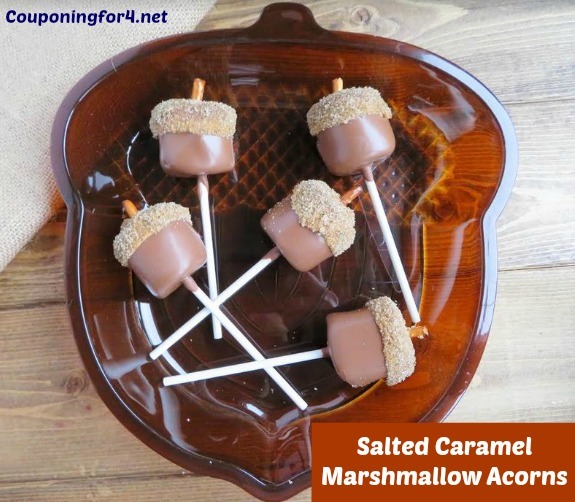 Take your chocolate-covered marshmallow and dip about a 1/4 way from top into the salted caramel. Tap on the edge of the bowl to remove excess. Immediately roll or dip the melted salted caramel marshmallow section in sugar until you get a nice even coat. Place the marshmallow standing up in a decorating stand, styrofoam bar or lay on a piece of parchment paper (not ideal, but a great backup!). Break pretzel sticks at the end and place on top of the marshmallow, pushing down a little so that it sticks in there. Refrigerate for 3-5 minutes or until hardened. Serve and enjoy! Ready for more deliciousness? Read more of my recipes! Poke lollipop sticks into the bottom of each marshmallow. Push them up about halfway into each marshmallow. Pour chocolate discs into a microwave safe bowl and heat for 30 seconds. Remove and stir in thirty second intervals until melted. Take lollipopped marshmallow and dip it in the melted chocolate, being sure to cover completely. Tap on the edge of the bowl to remove excess chocolate. Place in a decorating stand or styrofoam block. Place in the refrigerator for 3-5 minutes or until hardened. Place your sugar into a small bowl and set aside. Pour your salted caramel discs into a separate microwave safe bowl and heat for 30 seconds. Remove and stir in thirty second intervals until melted. 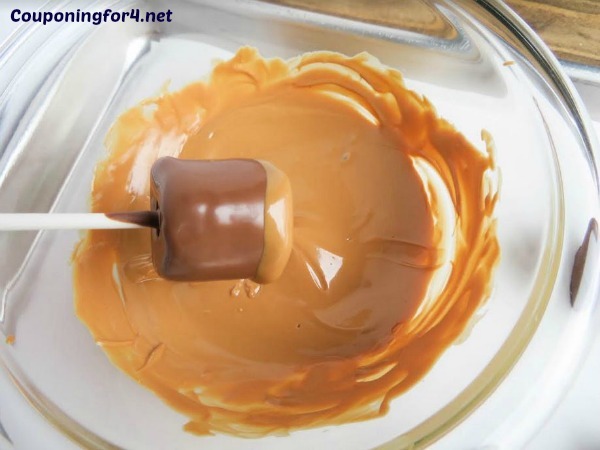 Take your chocolate-covered marshmallow and dip about a 1/4 way from top into the salted caramel. Tap on the edge of the bowl to get excess off. 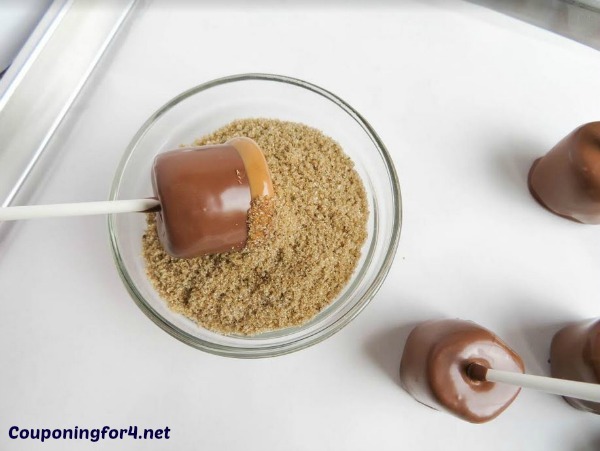 Immediately roll or dip the melted salted caramel marshmallow section in sugar until you get an even coat. Place the marshmallow standing up in a decorating stand or styrofoam block. Break pretzel sticks at the end and place on top of the marshmallow, pushing down a little so that it sticks in. Refrigerate for 3-5 minutes or until hardened. Serve and enjoy! That is such a cute and delicious idea. Those really look like acorns and would be fun to serve for Thanksgiving. They are so pretty you could even create place cards and decorate the table with them. Janis, they are super cute, aren’t they?? That’s a great idea to use them as table place holders! AMAZON – You don’t really need a description of this, do you?? Love Amazon! CENTS OF STYLE – Great fashion deals! DISCOUNT MAGS – Excellent deals on magazines! GROUPON – Get great deals every single day both in your town and across the nation! TANGA – Huge discounts on tons of items! ZULILY – Excellent deals on kids items & more! Alli is a Chicago based wife and mother of two children. She has turned money-saving into a game and enjoys searching out the best deals to help you save money! Alli shares her insight, tips and up-to-the-minute deals for local and national retailers and brands. Her hope is that you will play the game and learn to save money at the same time! © 2009-2018 Couponing For 4 Inc. All rights reserved.